The first shipment of cars was to be a major landmark, not just the for the company, but also for the people of Ulster as a whole. It had been a long time since they had anything of which they could share their pride. The last major industrial achievement of the province had been the completion of the RMS Titanic on 2 April 1912. That had been the work of an entirely Protestant workforce at Harland & Wolff. in marked contrast to the ship builder, at DeLorean we had gone out of our way to create a near 50-50 mixed workforce. Protestants and Catholics were working well together, and indeed, many were forming good social relationships outside the plant. The DMC-12 could be bragged about across all the social and religious boundaries. On 20 February, Northern Ireland Carriers began to move the first cars into the compound Bob Donnell's team had created on the dockside in Belfast Harbour. Two months later, on 20 April, the first batch of 379 cars left for Long Beach, California aboard the ship Continental Highway, arriving on 15 May 1981. These photos of the cars being loaded at Belfast Harbour are courtesy of former DeLorean Motor Cars Limited employee Neal Barclay. MORE vins and more files! 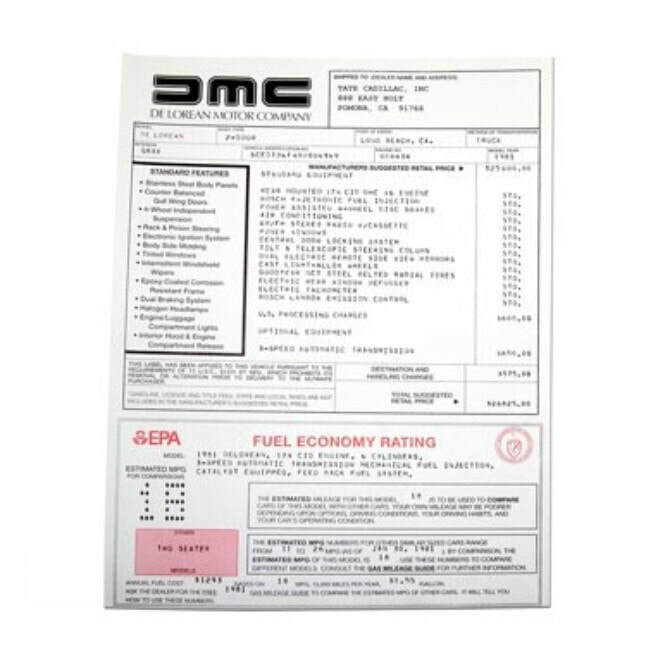 A recent new acquisition has allowed The DeLorean Museum to add over 1,000 more VINs for which we can now make the most authentic reproduction window stickers available anywhere, using factory data! If you've tried to the VIN Research Lookup in the past and not found your car listed, try again now! We may just have the information you've been looking to find! New additions to the online collection of The DeLorean Museum! The long awaited Long Range Product Plan document has been uploaded today which includes interesting details of the sedan project among other planned updates to the DeLorean car. ​The Zora Arkus-Duntov Archive was also added today, which includes interesting notes on the cars used during the press junket in 1981 at Dunmurry, copies of progress reports on the Legend twin turbo, and more! Today we've uploaded five NEW sets of minutes from the DeLorean Motor Company Limited (DMCL) weekly business meetings. These offer an insight into the progress of the project from it's earliest days and make for interesting reading. The importance of preserving of the documented history of the company cannot be understated. Like last time, we've seen some other ones of these change hands on eBay since our last update, and rather than have them locked away in a filing cabinet or stuffed in a box at your home, please consider sharing a copy with the rest of the DeLorean community! Contact us - we're not interested in your originals, just quality copies or scans that we can use to fill in the missing pieces of history!